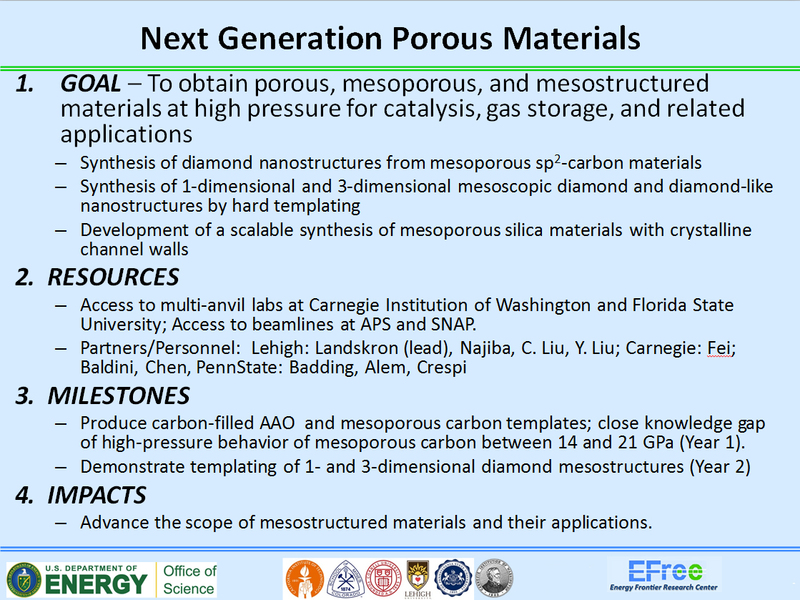 Goal: To obtain porous, mesoporous, and mesostructured materials at high pressure for catalysis, gas storage, and other applications. Overview: Applied pressure and the porosity of a material are antagonists because pressure has the tendency to eliminate porosity. As a consequence, a mesoporous material is more reactive at high pressure compared to a dense material. In EFree, work in the Next-Generation Porous Materials Project is designed to exploit this property to enable the kinetically controlled synthesis of high pressure phases. In addition, we apply templating techniques in high-pressure synthesis to produce mesostructured high-pressure phases. As a recent example, different nanostructured forms of diamond have been synthesized from SBA-15 type periodic mesoporous carbons. At 14 GPa and 1300 oC, size-tunable diamond nanocrystals be synthesized. By variation of the temperature and the reaction time, the diameter of the nanocrystals can be tuned from 50 to 200 nm. (Fig. 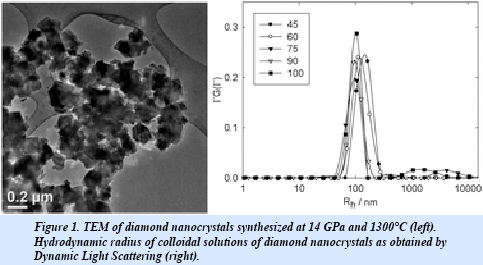 1) The diamond nanocrystals are non-aggregated and solution processible. Increase of the pressure to 21 GPa leads to the formation of mesoporous diamond (Fig. 2). One open question concerns the behavior of periodic mesoporous carbon in the pressure range between 14 GPa and 21 GPa. 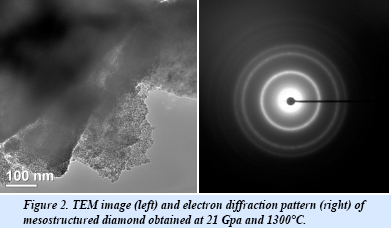 We aim to determine the influence of pressure on diamond crystal sizes, and at what pressure the transition between the diamond nanocrystal and the mesostructured diamond occurs. In addition, we are interested in the determination of the mechanical properties and the thermal conductivities of these materials. In another direction within EFree, we want to apply the concept of nanocasting at high pressure for the scalable synthesis of non-aggregated 1-dimensional diamond nanostructures. One-dimensional diamond nanostructures are energy-relevant because of their potential utility as one-dimensional heat conductors and the possibility to integrate them into polymers to produce diamond-reinforced polymers. At this point, non-aggregated, one-dimensional diamond nanostructures have been synthesized only by surface techniques, but these methodologies do not offer facile scalability. It is therefore difficult to produce highly uniform structures with good reproducibility. In EFree, we aim to close this knowledge gap. We are further interested in the scalable synthesis of mesoporous silicas with crystalline channel walls. Such materials are also potentially useful for catalytic applications in extreme environments, such as petroleum cracking, due to the high hydrothermal stability of the crystalline walls. Mesoporous quartz materials may also find application as sensors because of the combination of piezoelectric properties and high surface area.